Piracy at sea has reached its lowest levels in six years, with 264 attacks recorded worldwide in 2013, a 40% drop since Somali piracy peaked in 2011, the International Chamber of Commerce (ICC) International Maritime Bureau (IMB) revealed today. 15 incidents were reported off Somalia in 2013, down from 75 in 2012, and 237 in 2011. 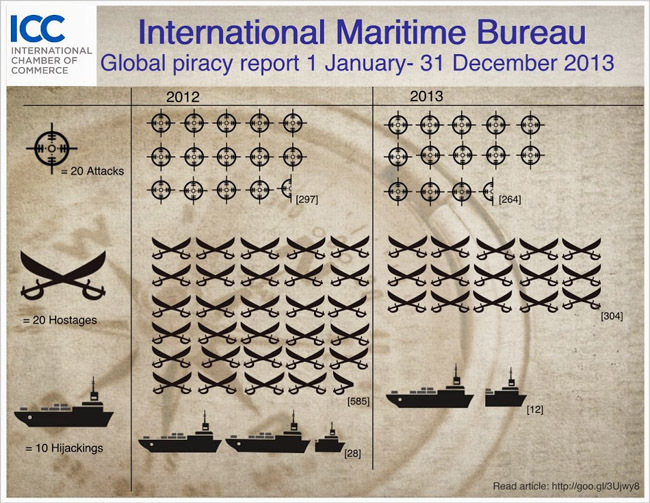 IMB’s annual global piracy report shows more than 300 people were taken hostage at sea last year and 21 were injured, nearly all with guns or knives. A total of 12 vessels were hijacked, 202 were boarded, 22 were fired upon and a further 28 reported attempted attacks. Nigerian pirates were particularly violent, killing one crewmember, and kidnapping 36 people to hold onshore for ransom.“The single biggest reason for the drop in worldwide piracy is the decrease in Somali piracy off the coast of East Africa,” said Pottengal Mukundan, Director of IMB, whose Piracy Reporting Centre (PRC) has monitored world piracy since 1991. IMB says Somali pirates have been deterred by a combination of factors, including the key role of international navies, the hardening of vessels, the use of private armed security teams, and the stabilizing influence of Somalia’s central government. Attacks in India and Bangladesh are also described as “low-level and opportunistic”. The incidents off India have increased year on year since 2010, reaching 14 in 2013, while IMB says active patrolling by the Bangladesh Coast Guard has kept the number of incidents off Chittagong in Bangladesh at around 12 for the last few years.